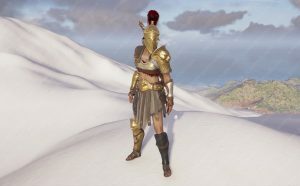 Assassin’s Creed Odyssey legendary armor sets are the best outfits in the game. They’re all golden quality equipment, and each one offers a set bonus – a new engraving perk that is active when you equip all the pieces. There is around a dozen of them, and they’re pretty difficult to obtain. Most of them are obtained in the second half of the game. 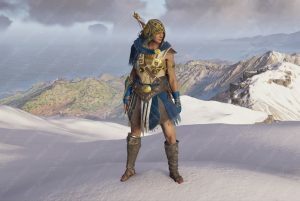 In this guide, we’re going to show you a list of all Assassin’s Creed Odyssey legendary armor sets, which set bonuses they offer, what they look like and how to get them. Obviously, there are a lot of story spoilers in here, so proceed with caution. You have been warned. The Snake Set armor is all about doing poison damage, as the name suggests. The different parts (Noxious Boots, Venom Gloves, Slithering Belt, Scaled Torso) all do different things to enhance your poison attacks. The set consists of a lot of rough cloth, various teeth and a snake skin mask. – If you want more info on the set, you should check out our Snake set legendary armor guide. The Agamemnon Set is focused on fire damage. It bears the name of the legendary Mycenaean king who fought against the Trojans in the famous war. It’s an ornate set with a golden pauldron which bears the king’s face, a chestplate with motifs from the Trojan war, and a terrifying helmet with two giant plumes. All of the parts will make your fire attacks more efficient. 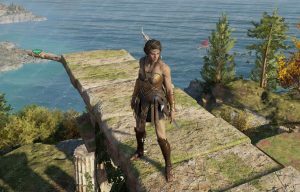 – How to get Agamemnon Set in Assassin’s Creed Odyssey? You need to defeat each cultist in the Silver Vein arm of the cultists page to get a set piece. 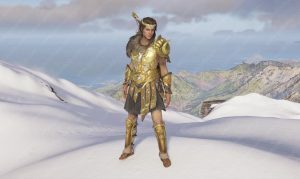 – More information on each set piece and their bonuses and levels can be found in our Agamemnon Set Legendary Armor guide. The Athenian War Hero Set is one of the two sets based on the warring factions of ancient Greece. The set combines blue, white and gold, and comes with a blue hood with golden ornaments. Each piece will increase the damage you do to Spartan warriors. – If you’d like to know more about it, go and take a look at our Athenian War Hero legendary armor guide. The Spartan War Hero Set is practically the antithesis to the previous one – each piece of the set will increase the damage you do to Athenian warriors. This makes it perfect for any warrior build, especially if you’re choosing Sparta’s side in the conflict. The set consists of shiny plate armor with red cloth to break the monotony, and a large red plume on the helmet. 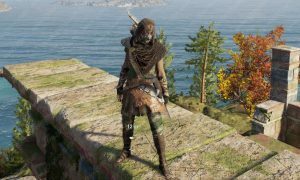 The Pirate Set looks like someone took Ezio’s black costume, wore it for 20 years while working in the coal mines and never once washed it. 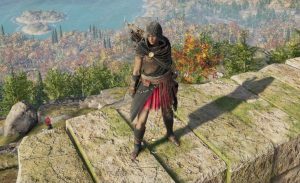 It will make you look like homeless Ezio, but it will also give you greatly enhanced assassin abilities. It’s good if you’re into that kind of thing – surprise attacks, backstabbing and such. – Once you’ve collected the whole set, you’ll get the Pirate set bonus engraving, which gives you +15% assassin damage. – If you want a more detailed breakdown of what it does, head on over to our Pirate set legendary armor guide. The Immortal Set looks like the game’s take on Persian armor from the period. The helmet has a dark brown plume, a turban and a black grimace mask. When you equip all the pieces, you’ll get an ability that helps you survive tough situations. It has a two minute cooldown, but it will most definitely get you out of certain tight spots you otherwise wouldn’t survive. – If you’re interested to know more about this peculiar outfit, follow the yellow brick road to our Immortal set legendary armor guide. 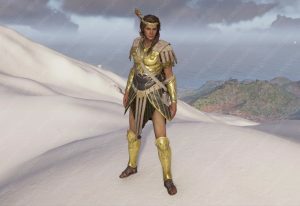 The Amazon Set is only available to Kassandra, while the Achilles set is exclusive to Alexions. They both have the same stats, so there’s no loss for either side. They have a pretty amazing set bonus that heals you when you do damage. The pieces themselves will increase your overall health, improve your regenerative abilities and such. – For more details about what each piece of the set does, head on over to our Amazon & Achilles legendary armor set guide. The Arena Fighter’s Set is obtained by powering through the arena questline, which begins when you get the invitation to the arena from the first mercenary bounty hunter you slay. 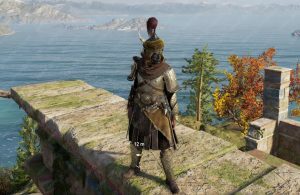 Once you’ve completed it, you’ll get an outfit that makes you look like a gladiator, and gives you a bunch of cool bonuses. The Artemis set comes in earthly tones, and it’s dedicated to the goddess of hunt. As you’d expect, it will make you more proficient with a bow and arrow. Each of the pieces offers some kind of cool archery related bonus. The Demigod Set will increase your offensive capabilities greatly. There’s an elven vibe to the outfit – it even comes with a tiara. If you’re into a specific play style, it might not help you much, but if you’ve leveled up all three skill trees equally, it will come in handy. – If you want to see their stats or learn more about the armor, check out our Demigod set legendary armor guide. 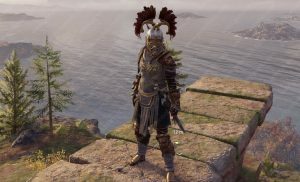 The Greek Heroes set makes the wearer much harder to kill. When it comes to looks, it’s like a souped-up version of the previous one – you’ll get a fur shoulder cloak and some golden ram horns all around. It’s also one of the hardest sets to unlock. 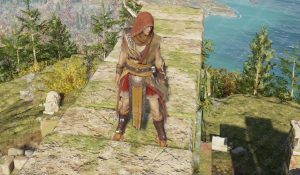 Another homeless Ezio costume, the Pilgrim’s set will make you look like Ezio if he had been living under a bridge for 20 years. It’s a riff on his classic white outfit, and it looks pretty ragged. It will make you a better assassin, by helping you stay invisible. 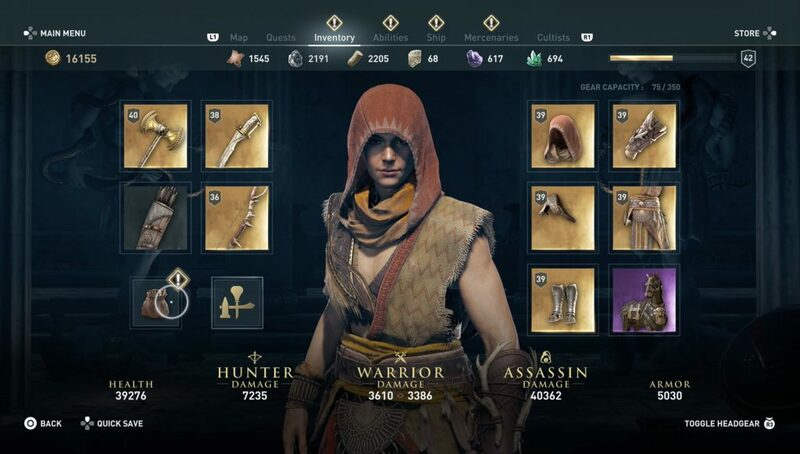 Greek heroes set is obtained by killing mercenaries they occasionally have a piece as their reward checking the mercenary screen and tracking the ones who do is a very useful way of finding them. Last piece is on a level 49 and is the crown. 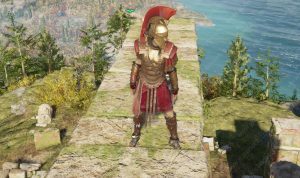 I was able to get a piece of Greek hero armor from a mercenary so maybe look into that? I can confirm that Greek Heroes Set is indeed all from 5 different Mercenaries. I am not sure if its the same ones for everyone’s palythrough but it could be. I got hands first at 20, than feet around 25, body at 30, legs at 41, and like previous commentor said head from 49 is the last one. I just kept my bounty in the 2-3 range while traveling a ton to keep guys coming after me to get clues to unlock as many as I could. You’re missing a set. It’s called the Pilgrims set. 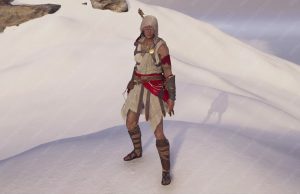 It looks the most classic assassin, white, hooded, red sash, etc. it’s an assassin boosting armor with increases to daggers and crit. Collecting all five gives you the enchantment which reduces Shadow of Nyx by 40%. This set can be found in treasure chests all over the world. Easiest way to find them is to pick up that boost to find legendary chests with helix. And agree with person above, Greek hero set is obtained from mercenaries. I got mine in the same order, but at different levels. Gloves were at 9, boots at 22, chest at 30. Finished the arena but only got 2 pieces of the legendary set, arena fighters gauntlets and arena fighters waistband. I completed this at lvl 41 / 42. Do I need to go back and beat every champion again in their lvl 50 versions? Or is this a known bug? the answer to your question is yes. you need to finish all the enemies and then fight their lvl 50 versions i got all mine after i defeated the huntress.